Even when legal, the controversial practice of choosing to die after a terminal diagnosis is difficult. Aaron McQ of Seattle shared his story. 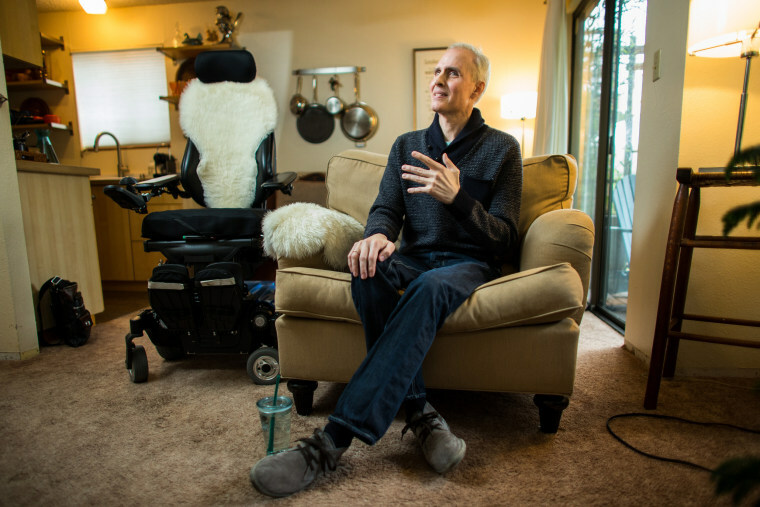 The 50-year-old Seattle man — a former world traveler, triathlete and cyclist — learned that he had leukemia five years ago, followed by an even grimmer diagnosis in 2016: a rare form of amyotrophic lateral sclerosis. An interior and urban designer who legally changed his name, McQ had been in pain and physical decline for years. Then the disease threatened to shut down his ability to swallow and breathe. Last fall, McQ decided to use Washington state’s 2008 Death With Dignity law to end his suffering. The practice, approved in seven states and the District of Columbia, allows people with a projected six months or less to live to obtain lethal drugs to end their lives. More than 3,000 people in the U.S. have chosen such deaths since Oregon’s law was enacted in 1997, according to state reports. Even as similar statutes have expanded to more states, including, this year, Hawaii, it has remained controversial. Neurodegenerative diseases like ALS are particularly difficult, said Dr. Lonny Shavelson, a Berkeley, California, doctor who has supervised nearly 90 aid-in-dying deaths in that state and advised more than 600 patients since 2016. Philosophically, McQ had been a supporter of aid-in-dying for years. He was the final caregiver for his grandmother Milly, who he said begged for death to end pain at the end of her life. By late spring, McQ’s own struggle was worse, said Karen Robinson, McQ’s health care proxy and friend of two decades. He was admitted to home hospice care, but continued to decline. When a nurse recommended that McQ transfer to a hospice facility to control his growing pain, he decided that he’d rather die at home. “I don’t want to talk about it because I don’t want to feel like 'now, you gotta,'” he said. “There was a part of him that didn’t want it to be like 'this is the day,'” she said. DeRoche arrived exactly at 5:30 p.m., per McQ’s instructions. At 6 p.m., McQ took anti-nausea medication. Because the lethal drugs are so bitter, there is some chance that patients won’t keep them down.